When it comes to using recycled paper, the possibilities are truly endless. Whether you’re crafting something out of paper or simply swapping out more plastic items for paper items. Throughout this article, we explore all the different uses for recycled paper and discuss how versatile using recycled paper products actually is. 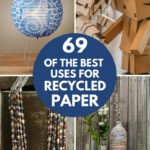 You may be surprised at some of the unique uses of paper and who knows, maybe even become inspired to test out a recyclable experiment on your own! With so much attention on the dangers that plastic brings into the environment, changing a simple, everyday item such as a coffee cup from plastic to paper can positively impact the world. 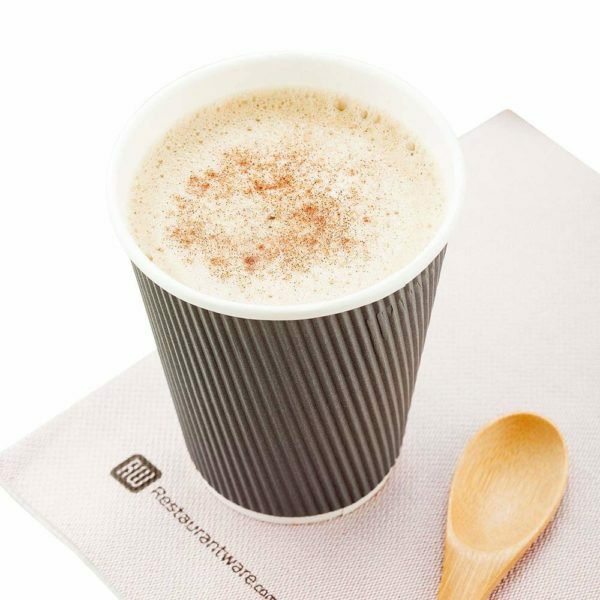 With these disposable cups, there is not plastic that will remain in landfills for decades to come, as these nifty cups simple dissolve over time. 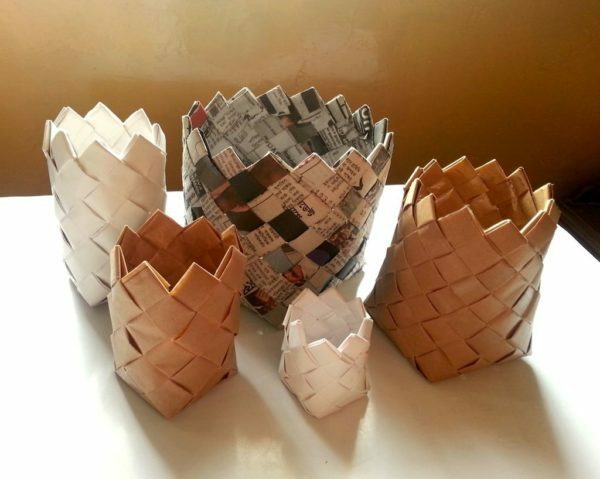 This cool DIY tutorial teaches you how to craft you’re very own recyclable paper basket by weaving strips of paper into a basket. This is a super cool activity to try if you have kids and are looking for some fun, at-home activities to try during the summer. This is also a great way to teach kids how to use things to create something else. 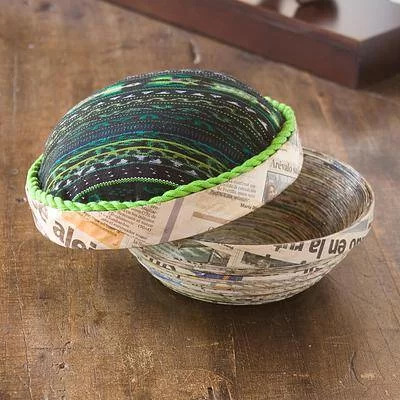 This recycled bowl is not only a great use for recycled paper, but it looks super cool too. There are ways to construct these types of bowls on your own, but this is a bowl already crafted and ready to purchase if you’re in a time crunch. You can also use brightly colored strips to create a more colorful piece. Think of all the plastic baskets that go to waste each year during Easter. These one-time use only baskets often get discarded, and that harmful plastic takes years and years to dissolve in landfills. 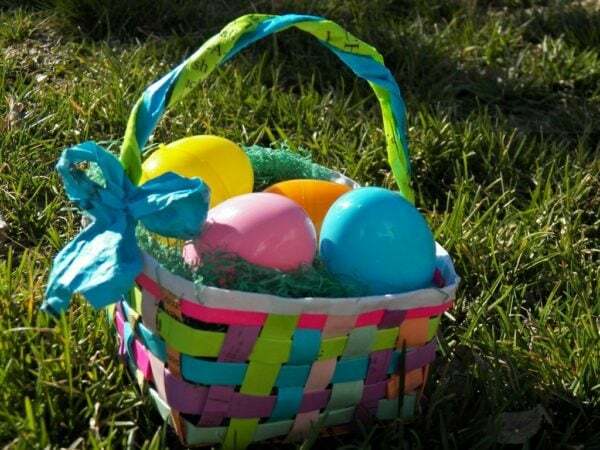 Instead, why not try to create your very own Easter basket out of recycled paper? This informative inscrutable article explains how exactly to do it. Although you can’t eat out of it, this recycled paper bowl is still super useful when it comes to storing items or using for decoration. 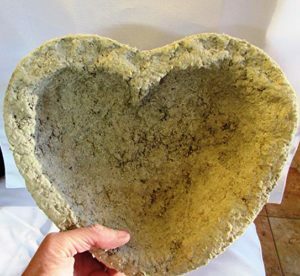 This is a neat instructable that allows the creator to make an actual pulp from recycled paper items and form the pulp around an actual bowl to create another one. This is a super cool item that will definitely draw attention. 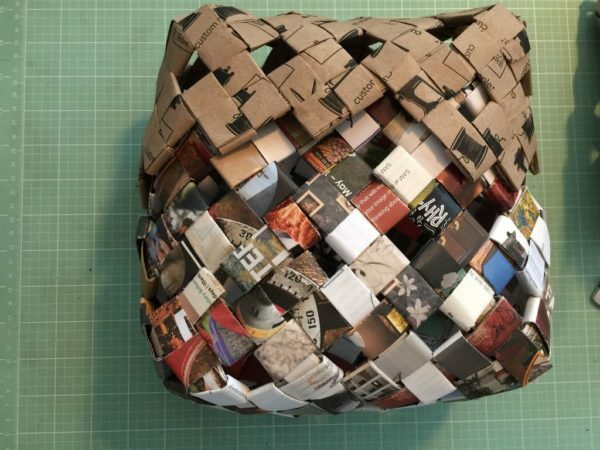 This super cool basket is woven entirely out of junk mail. This is a great use for all that extra mail that clutters up the mailbox. 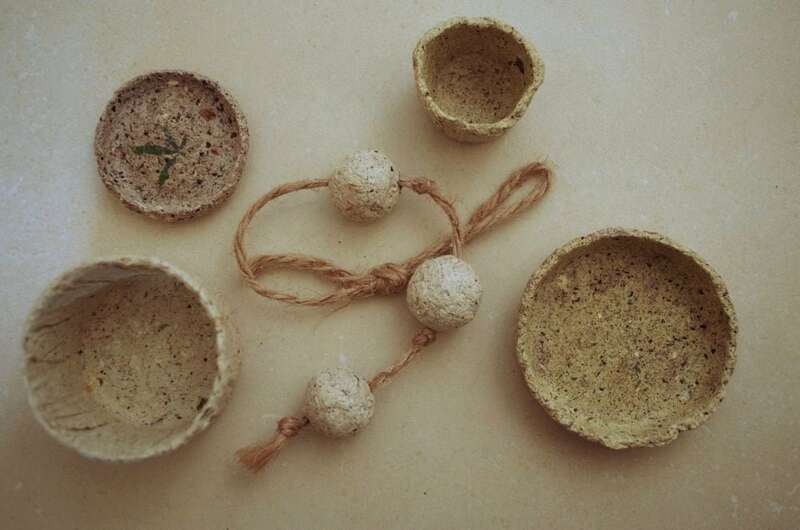 Instead of throwing it all away, turning it into something useful is a great step in becoming more earth conscious. This basket can be used for decoration or put to use as a functional magazine holder or toilet paper container. This is a cool idea for a gift box. 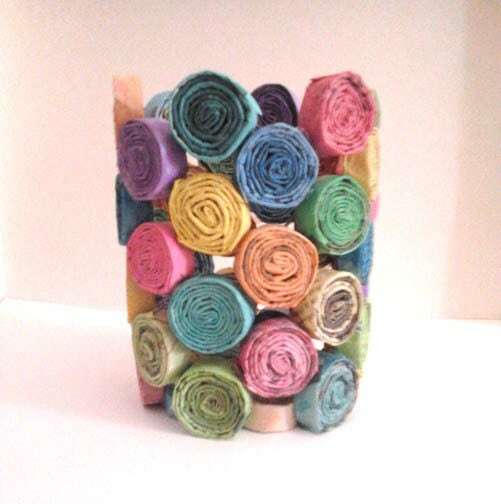 Instead of buying a box already made, why not craft one out of recycled paper? If anything, this will only add to the gift since the box can virtually act as a gift on its own. This is a great way to use up some old paper laying around and create something truly beautiful from it. This is a neat tutorial for how to create a paper bowl. 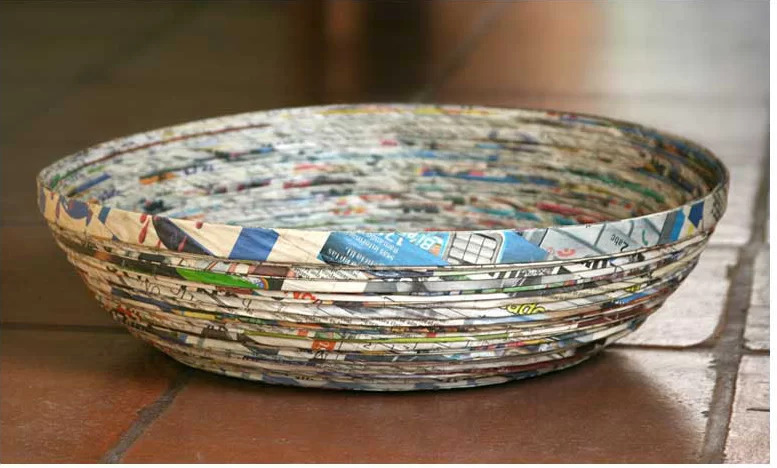 Using old newspapers, or really any kind of paper strips, you can roll them into spiral shapes and create a beautiful bowl out of them. You can use this bowl as a unique gift to give to a loved one, or simply use it as decoration within your own apartment or home. 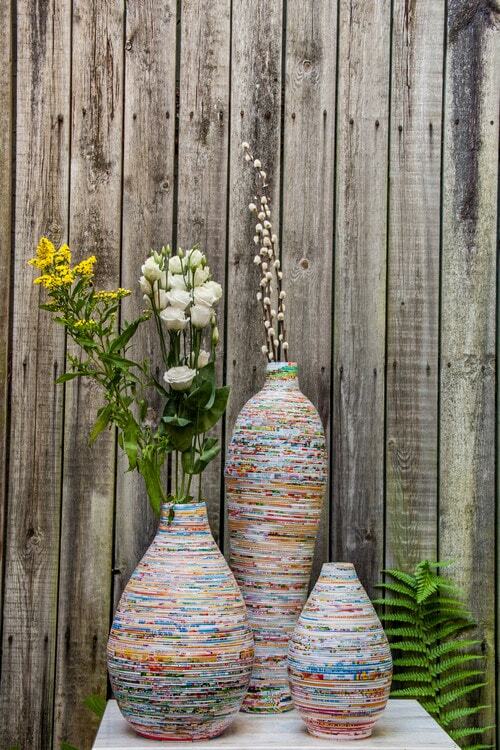 Using a basic pulp made from recycled paper bits, you can virtually create all kinds of interesting containers. In this tutorial, for example, you can learn how to construct adorable little pots with lids that can hold anything from makeup to change. You can also paint these little containers and give them as gifts. I’m sure you’ve seen those beautiful paper wall decorations before, but instead of paying the hefty price for them, why not try to craft them for yourself? Using anything from newspaper to old books, you can easily learn how to weave and construct these types of flowers and spray paint them to match any sort of décor or theme. Maybe buying a tissue box cover for your box of tissues may seem like a silly, needless purchase, but if you make it yourself it can really add some personality into a space. This cover is really cool because it uses the bright, glossy pages of magazines in order to create the shiny tissue box cover you see here. Try it for yourself! This paper starfish is a great example on the types of décor or gifts you can make from recycled paper. 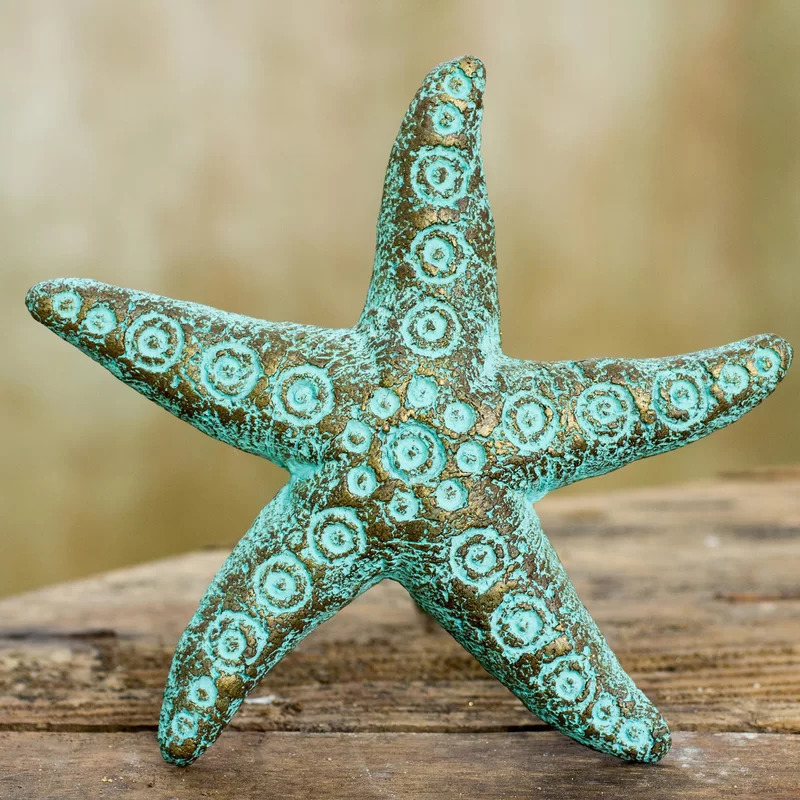 This starfish is constructed entirely out of recycled paper pulp, which is then molded into the starfish shape and then painted over. This would be a fun project to add some décor into a bathroom or spare bedroom. 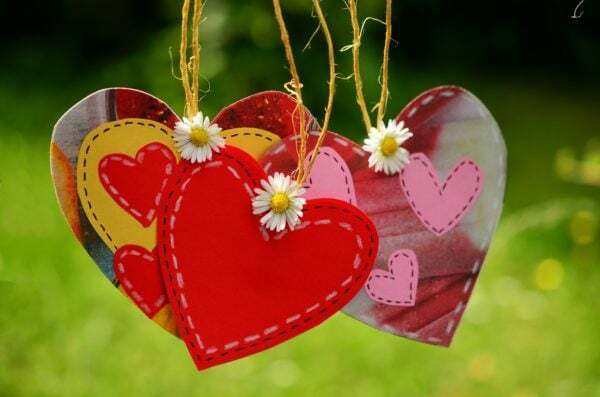 These paper hearts can be used for pretty much anything, from basic room décor to gift tags on presents. The possibilities are endless with décor like this, and better yet, you can easily paint them to match any type of décor you have throughout any given space. Here’s a super cute and fun idea for children or the young at heart. 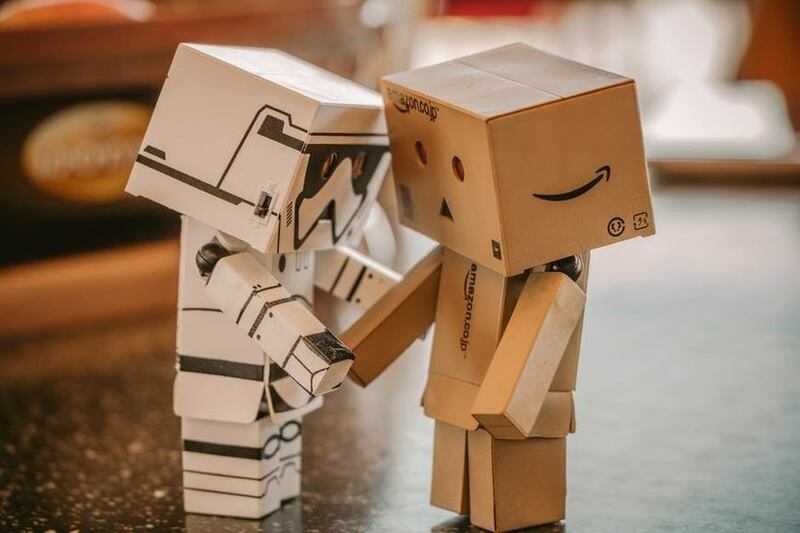 Why not recycle some cardboard and create some cute little robot figurines? You can either use already-built boxes or simply use pieces of cardboard to construct your own robot friends. This would be a great project for kids. 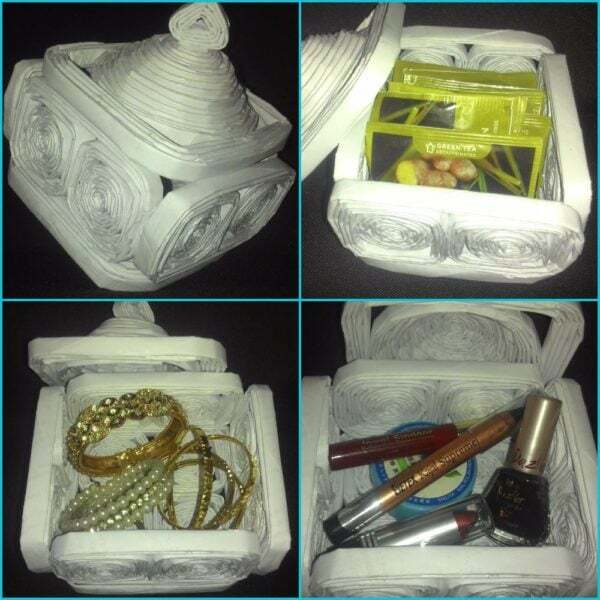 Instead of going out to buy a decorative or functional basket, why not create your own? Using recycled paper, you can easily create your own one-of-a-kind basket that you can fill with almost anything you want – just as long as it isn’t too heavy. This is a great idea for the holidays. Instead of buying expensive Christmas décor, why not recycle some paper products and create your own decorations? This is not only a great way to save money, but you can feel proud about being so environmentally friendly as well. Here’s another funky idea for a gift. 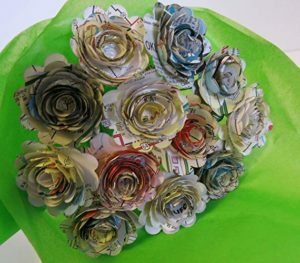 Instead of throwing away all those old newspapers, why not create something useful out of them? This adorable little box is made up of old newspapers and material. You can weave the newspaper together in order to give it this unique shape. This is a great gift idea! This would be the perfect decorative piece to set out around Easter or spring time. The paper is honeycombed from either newspaper or book paper. It doesn’t really matter what kind of paper you use, as each type of paper can give you that honeycomb shape if you cut it the right way. 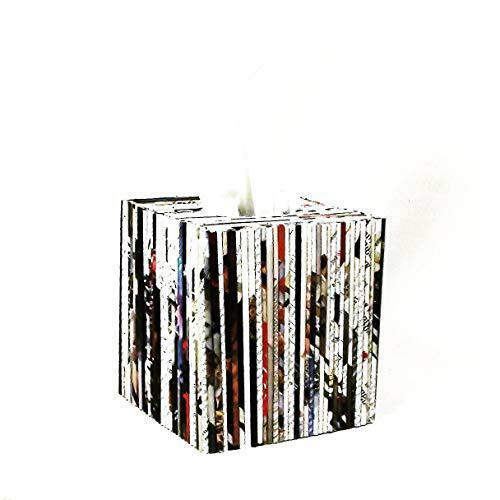 This adorable desktop recycled paper lamp would make a great gift for anyone who is in college living in a dorm room or even anyone who lives in a smaller apartment. 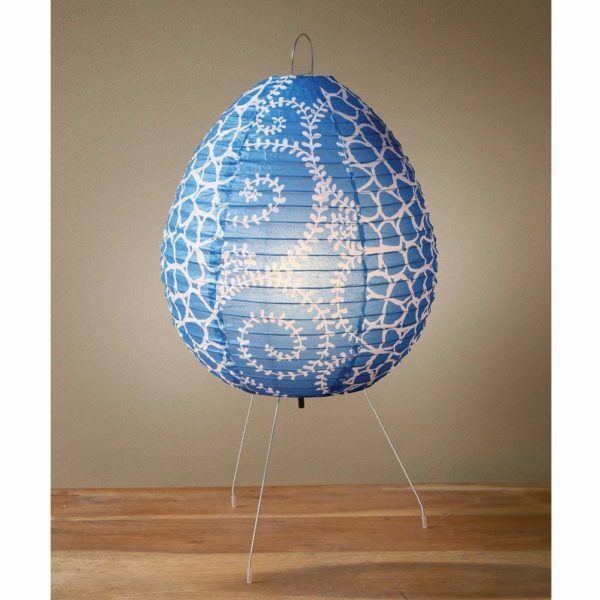 This lamp adds so much character to the space due to the brightly colored lamp shade and it’s a major plus that it’s using recycled paper! 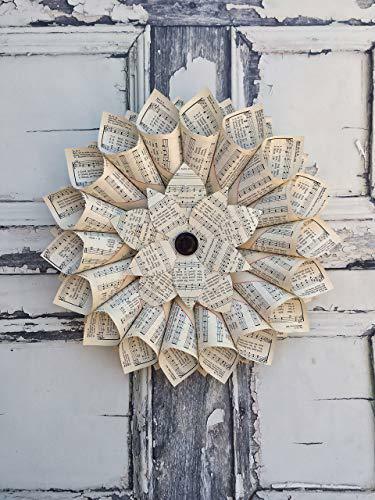 Ideal for the music lover in your life, this wreath is entirely made up of sheets of music. You can easily find music books from old school libraries or even public libraries, and most of these places have a recycle bin or pile anyways. You may even be able to get old music books for free or pay a minimal fee. 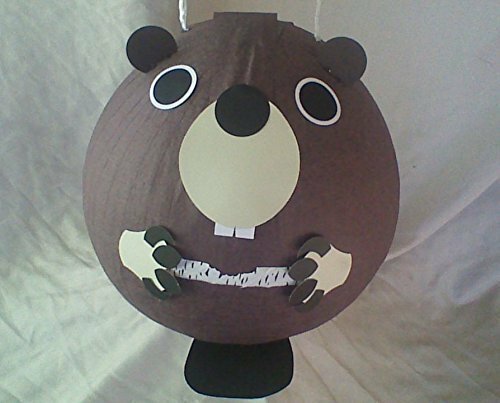 This piñata is in the shape of a beaver, but you could really construct a recycled paper piñata into just about any shape you want to. In this case, the beaver looks adorable with his buck teeth and tiny paper birch. This would be a cost-effective way to add some entertainment to a kid’s party. 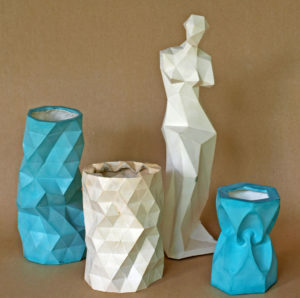 These decorative vases are made entirely out of paper. 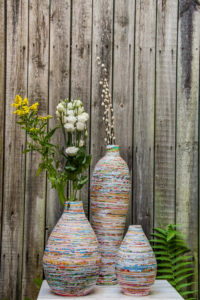 The different colored paper throughout these vases give them their distinct texture and shape, but if you preferred to keep everything one color, you could easily spray paint them in order to match any décor. This would also make a great gift item. 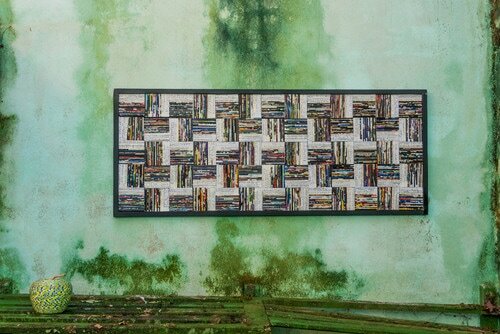 If you don’t feel like creating any type of functional recycled paper item for the home, you can create your own unique piece of art. Just like this piece of art hanging on this wall, the varying textures and colors in the paper make this piece a truly remarkable artwork to look at. 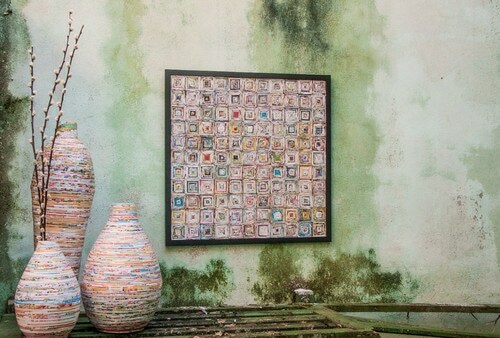 This unique artwork features plenty of spun paper that forms a larger piece. This would be an ideal piece for a living room wall or even a guest bedroom that has the appropriately sized wall for the piece. If you’re making it yourself, you can easily scale up or down depending on the size. 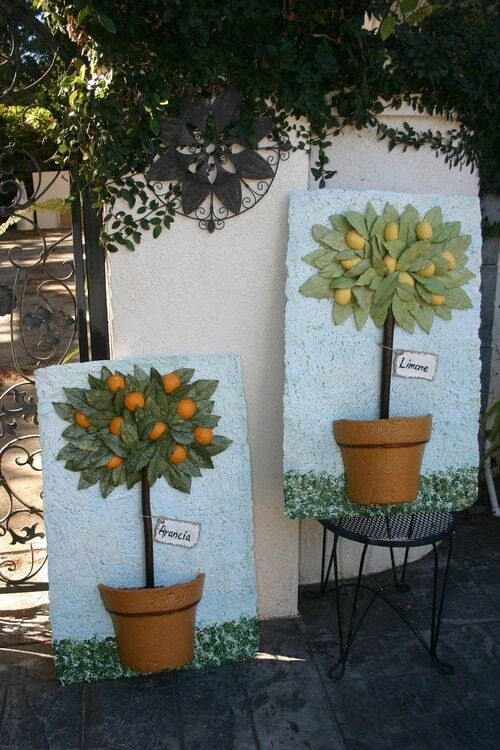 These recycled paper murals feature beautiful citrus trees with plenty of ripe fruit. You can even construct the canvas with recycled paper, but keep in mind the texture will be messier than your typical canvas. 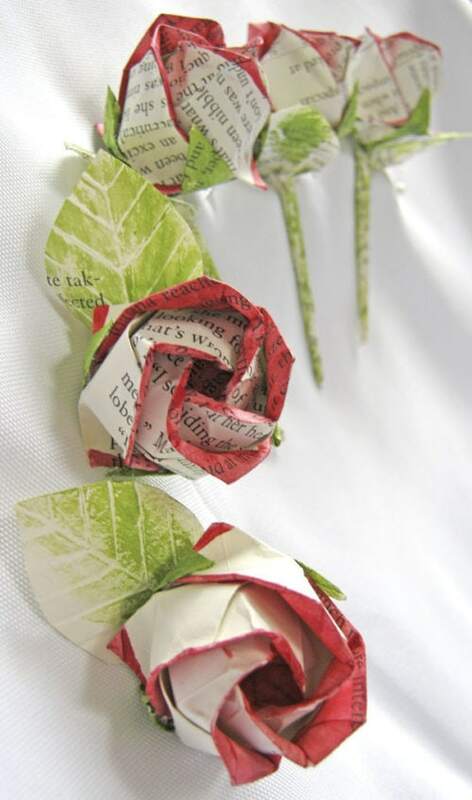 There are also plenty of ideas online when it comes to creating your own recycled paper work of art. Instead of buying silk or plastic flowers for your next luau party, you can easily create your own using recycled paper. This may seem like something only an expert could do, but the process is really quite easy. It’s a simple as cutting and tying in this case. Use colored paper for an even brighter lei. 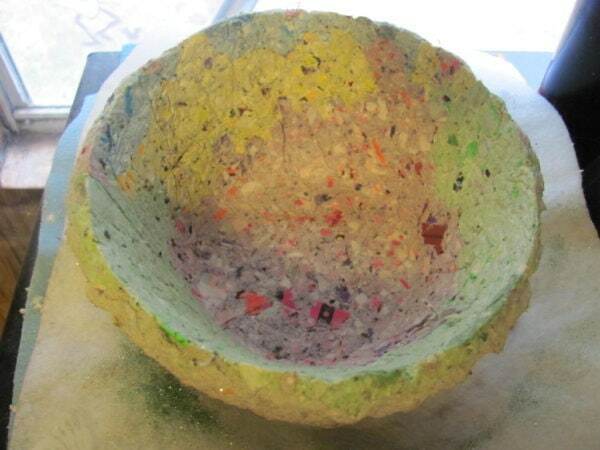 Create your own wide, paper bowl with recycled paper! This would make the perfect addition as decoration to the kitchen table or dining room table. 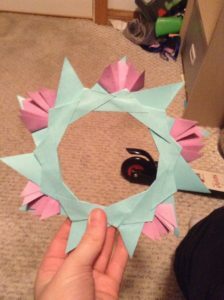 You could even create your own paper flowers like the ones in the picture to add some color into the mix. 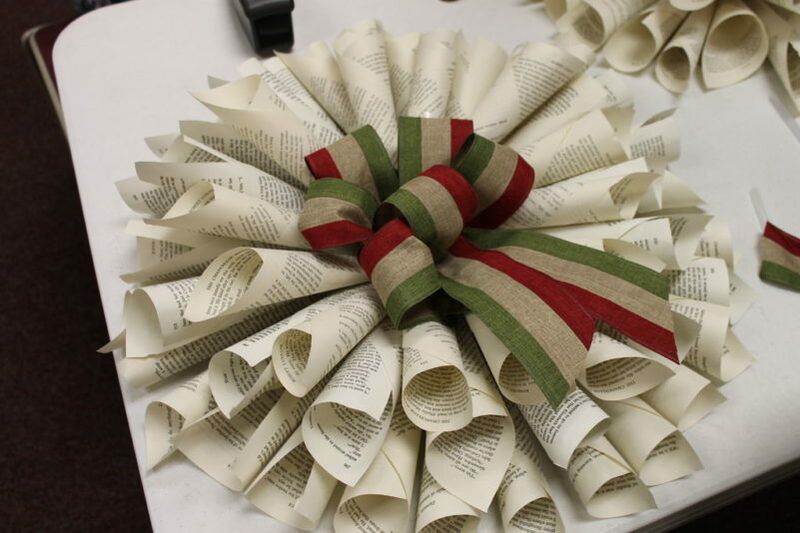 Another great gift idea for the reader in your life, this wreath consists entirely of book pages. You could find the person’s favorite book and easily roll up the pages to construct this literary dream of a wreath. This would make an especially great gift for a teacher or an editor. 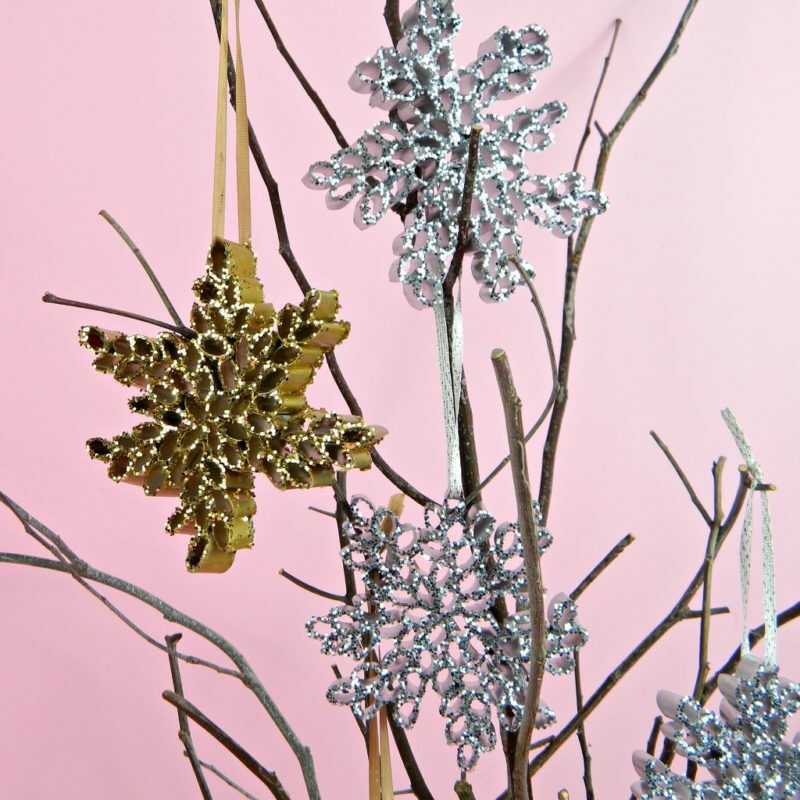 This DIY gives you a step-by-step process in making your very own homemade snowflake ornaments. Rolling up and gluing strips of magazines results in these gorgeous, sparkling snowflakes that can either be turned into ornaments or used to decorate a wreath or tree within the home. 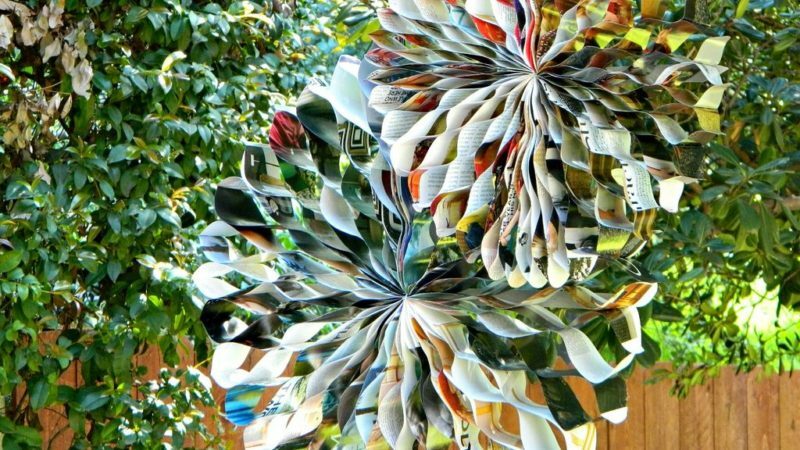 Using old, recyclable magazines, you can easily create some fun party decorations. You know, the fun types that hang from the ceiling and sparkle in the light. These can actually be pretty expensive if you try to buy them in stores. With this method, you’re saving so much money and creating unique pieces. 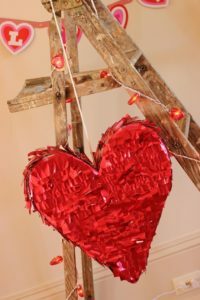 This recycled heart piñata will be the best thing at the party for sure. Not only is it gorgeous in that bright red color, but it’s entirely constructed from recycled materials. This would make a great party extra if you’re having a bachelorette party or just feel like beating a heart around. 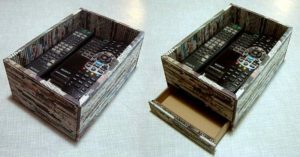 These recycled newspaper boxes are a great way to utilize some extra counter space, especially around the TV area. 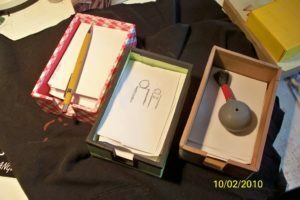 These cool boxes not only look great, but they are highly functional and come complete with a hidden drawer that you can store remotes or paper in. Here’s a great idea in how to use old toilet paper rolls. Often items like these get tossed away with little to no thought on how wasteful it is. If you start to collect rolls of toilet paper, you could easily turn them into this neat Advent calendar. This would also make a good project to do with kids. Using recycled paper, you could easily construct this paper lamp. This DIY tells you exactly how to do it, step by step. This creates a really unique lamp that will surely draw plenty of attention. What’s great about using recycled paper is that you’re making something out of what would have been trash. These paper rose boutonnieres are fantastic. These would make great accessories for high school dances or even a cost-effective way to add more elements to a wedding without having to spend too much. These are creative and a great way to add some intrigue into decorations. 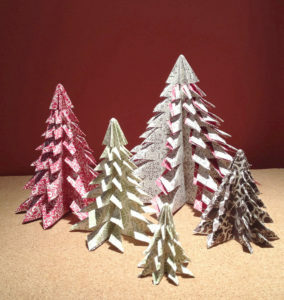 Being able to use recycled paper for holiday décor is such a great way to be earth conscious and crafty. 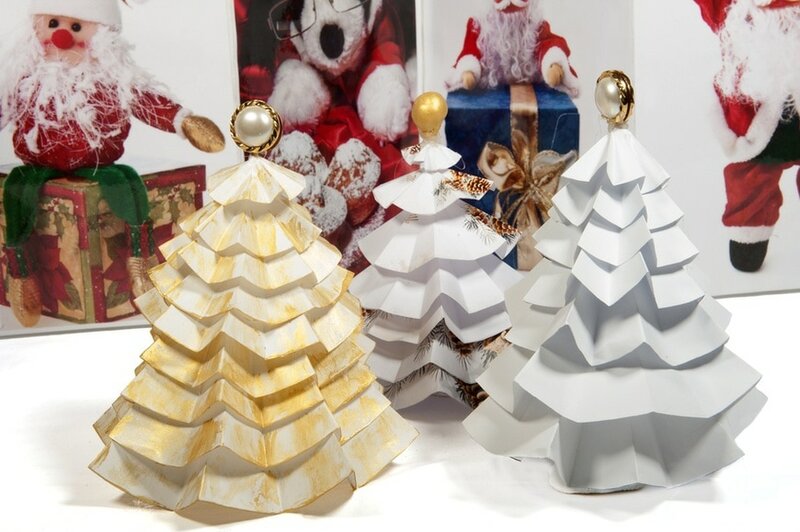 These adorable holiday trees would make the perfect addition to any tabletop holiday décor. You could leave them as the raw paper, but you could also spray paint them or paint tiny holiday decorations on them. 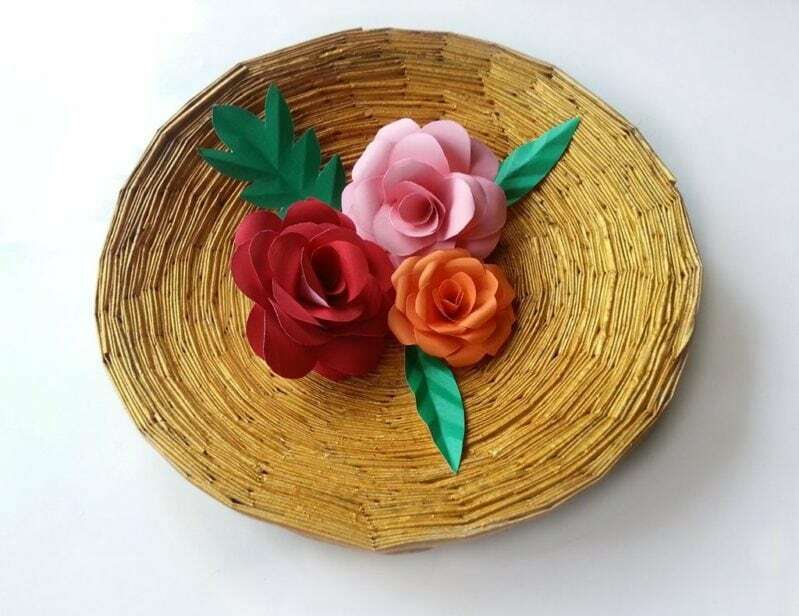 These awesome paper flowers bring beauty that will last forever. Unlike real flowers, these paper flowers are sure to stay bright and well. 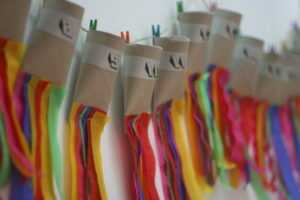 This is also a great way to use up old pieces of construction paper or even cardstock that you would otherwise discard. 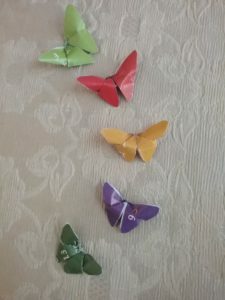 These paper butterflies will add plenty of charm into a space. They are not only adorable, but entirely made of recycled paper, which is always great. You could use colored paper or simply paint the butterflies to match all kinds of room décor. This paper vase is super cool and would make a great gift for that friend or family member that enjoys modern or minimalistic décor. Leaving this vase in its raw state makes the whole concept look even cooler. You could easily keep silk or paper flowers in here to add more into a space. This paper city is constructed entirely of recycled paper. This is a great idea if you need to construct a school project or are a hobbyist who enjoys working with your hands. 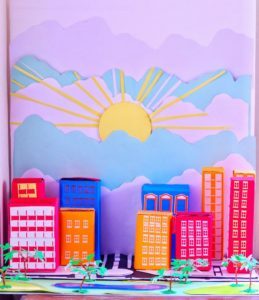 Construct you entire neighborhood out of paper for a fun, creative project. These interesting molds have been crafted with paper. 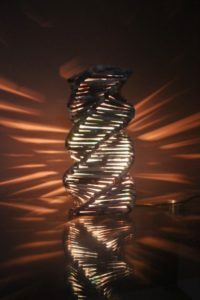 Since paper is easy to sculpt with since it’s easily bendable and holds well together with glue, you can create all kinds of interesting tabletop pieces. The art of folding paper may seem difficult, but it’s easy to do once you take the time to learn how to do it. These interesting paper orbs are great ideas for a party. Party décor can actually be somewhat expensive and it’s an unnecessary cost for something that is only going to be used once or a few times. With these recycled paper orbs, you can add decorative elements to a party that won’t break the bank. 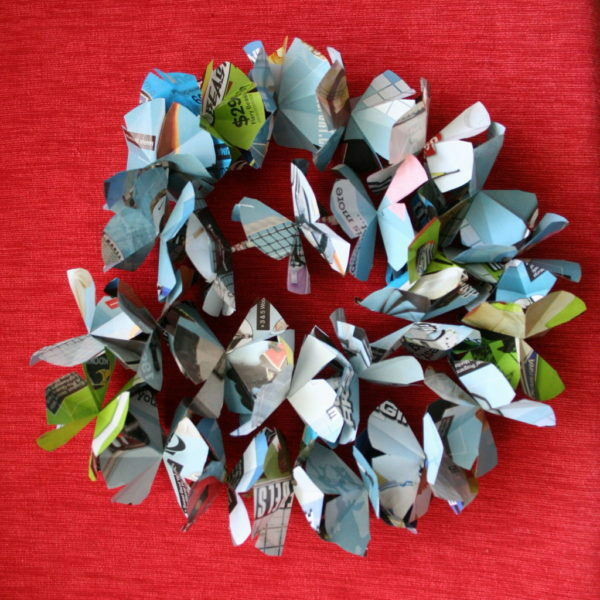 This cool paper wreath would be the perfect addition into a bedroom or hallway. Much of the décor you see hanging in homes are costly, but with a paper element such as this wreath, you can easily add décor without having to spend so much money. You’ll feel good about it and it will make your home feel homier. 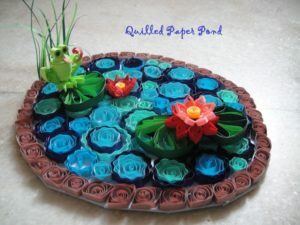 This incredibly cute paper pond not only looks super adorable, but would make a great project to do with little ones. You could even make this a classroom project learning about ecosystems and natural habitats. Using recycled paper to construct this if even better, because conservation comes into play. 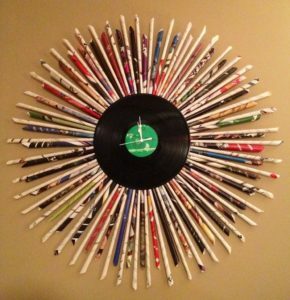 This super cool record clock would make the perfect gift for the music enthusiast in your life. This DIY tutorial gives you all the details in how to create it. The rolled paper back of this clock is especially interesting since you could make the rolls out of old record sleeves or even magazine articles about specific bands. You can buy a cat all types of presents and toys, and they’d still prefer to play with strings or wrapping paper. 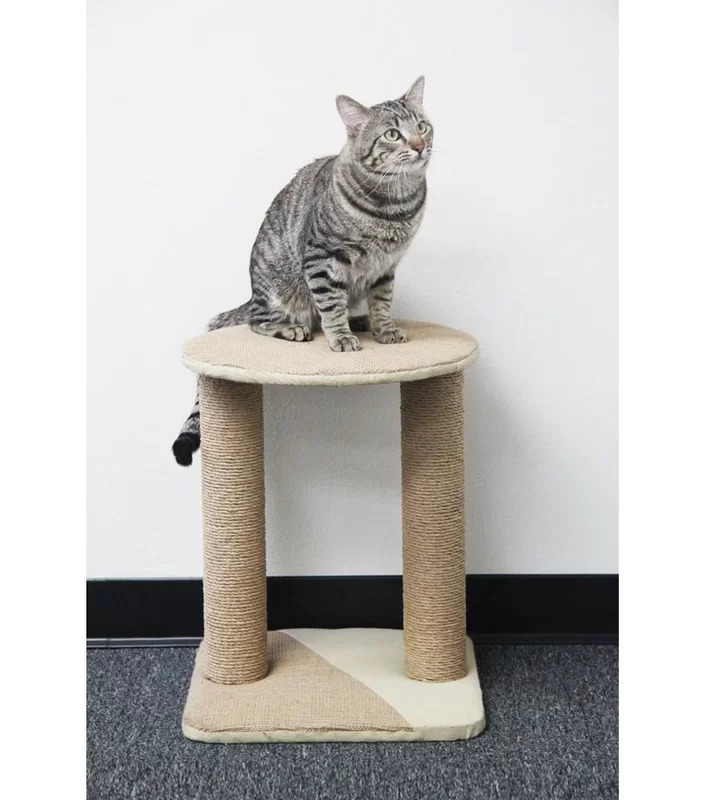 You could easily create or buy a cat perch made out of recycled paper so they could have a place to hang out and scratch on. Since the item would be made out of recycled paper, you’d feel ok letting a cat rip it to shreds. This planter pot would make great addition to the garden and you can feel extra good about it since it’s made entirely of recycled paper. You could easily grow some little seedlings in the pot or start an herb garden, but you’d probably have to either line the pot with plastic or foil to prevent the pot from getting too soggy from water. These necklaces made from entirely recycled paper are so unique and would make a perfect gift. The gifter can feel good about making such a sustainable purchase and the giftee would love how unique this gift truly is. 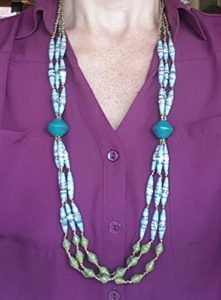 Better yet, why not try and make your own paper beads and create your own unique piece of jewelry? 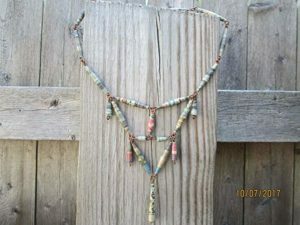 This gorgeous necklace has strand over strand of recycled paper beads. This unique necklace is so gorgeous and would definitely make a striking conversation piece at that next cocktail party. 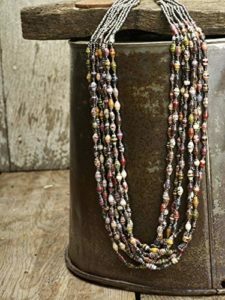 You could either leave the beads in that natural paper state or paint them to create interesting cascades of color. 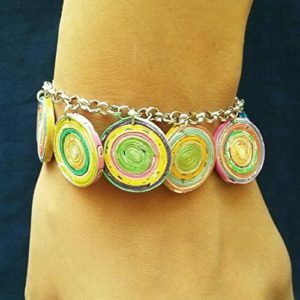 These paper bead spirals look gorgeous on this bracelet. 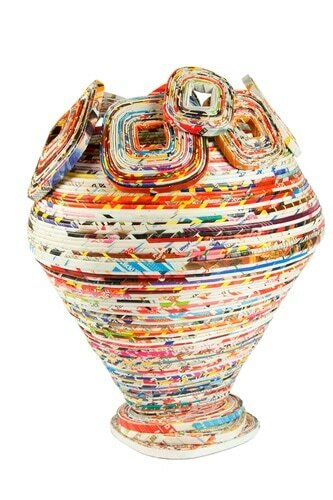 This is such an interesting piece of jewelry and the fact that it’s made from recycled paper is astonishing. This would make the perfect gift or a perfect gift for yourself whenever you feel like you want to treat yourself to something awesome. 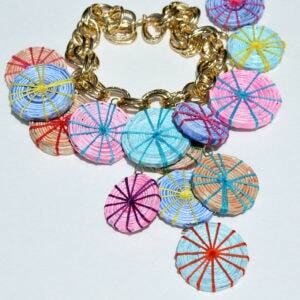 These blue and gold paper beads come together to create a beautiful necklace. This would make a great accessory because it’s so unique and the blue and gold look magnificent together. You could either buy this as a gift or attempt to recreate it on your own in different colors. These stunning necklaces are made entirely from paper beads. These are truly gorgeous items and they would make the perfect gift or accessory. If you want to draw some attention and turn some heads at that next party, going with one of these necklaces is a perfect way to do that. 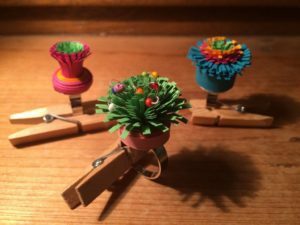 You can add so much detail into these paper hoop earrings. The centers of these earrings can be made entirely from paper beads so the earrings may look heavy, but they’re made of paper so they wouldn’t be too heavy. You could get as creative as you wanted with these types of earrings. These spring rings make the perfect seasonal piece of jewelry. 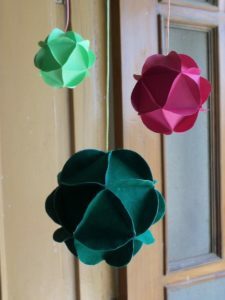 These are absolutely adorable because you could easily construct these to look like a fresh field of grass with flowers or simply create a single flower made entirely from recycled paper. This would make a cute party idea for a kid’s party, too. This is the perfect gift for someone going back to school or for someone who journals often. It’s a really personal gift in that it is handcrafted and comes with a lot of love. 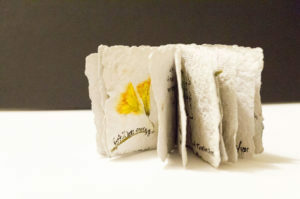 It’s remarkable to be able to create something as beautiful as this from recycled paper and it would make a lovely gift. 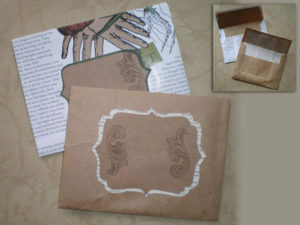 These recycled paper envelopes make the perfect companion to a handwritten letter. Yes, people still write letters to each other. Being able to make an envelope out of recycled material is just that little extra unique step that will make the receiver of this letter feel special and thought of. These recycled noteholders are made entirely of old reports. This could also work with any type of junk mail or other papers that you would otherwise throw away. This tutorial shows you exactly how to do it and you can make the noteholder unique by painting them and adding some flair to it. 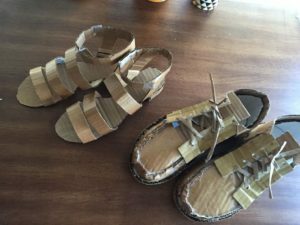 These shoes are made entirely of recycled cardboard. Surprisingly enough, these shoes can actually be worn and act as real shoes. You may not be able to go trekking around in the snow or rain in them, but they’re a pretty cool take on a shoe and can be painted for more color. 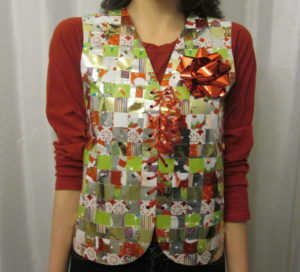 This gift wrap vest would be a hit at that next holiday party get together. This is obviously taking it a step further from that classic ugly holiday sweater thing. You can weave old bits of wrapping paper together to create this amazing vest. Make it complete by tying it up with ribbon. Not for the easily shy, this dress is a bit risqué but is truly astonishing. If you want to make a statement, this is the style to go for. 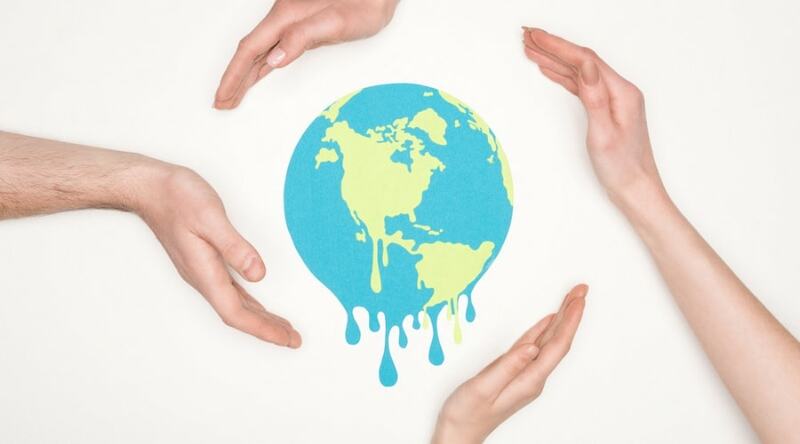 You could be representing the importance of recycling or earth friendliness. Whatever message you are trying to convey with this dress, you are sure to get attention with it. 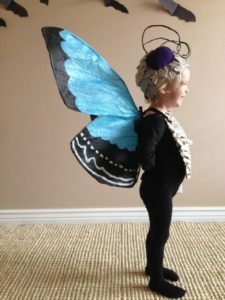 This paper butterfly costume is adorable enough to believe it’s store bought. Better than store bought, though, this costume features some handmade touches that only a handmaid costume could contain. This is a great way to save money and help the earth, too. Plus, it’s super adorable. 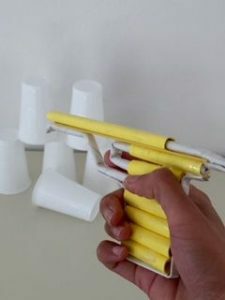 This paper pistol shoots paper bullets – how fun! This is the perfect fun project to do with kids and you can teach them about the importance of recycling at the same time. This is also a great way to use up some paper that you’d otherwise just throw away. Yay for making things out of nothing. 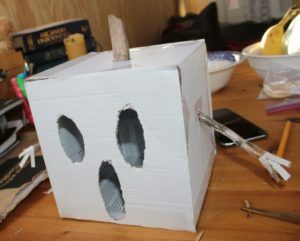 This ghost box is a super cute decoration you make for Halloween or just for anyone who loves all things spooky. This is a pretty easy project that will be fun to do since you can make it completely personal and unique. Paint it orange and make a Jack-o-lantern if you aren’t feeling the ghost. 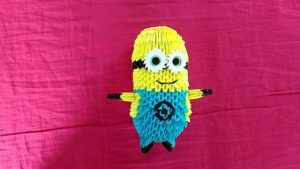 This paper minion would make the perfect addition to a young child’s room. You could even make a few of them and have them scattered about the room to create an army of minions. It’s incredible that you can make creations like this out of paper, but paper is so malleable that you can virtually create anything. 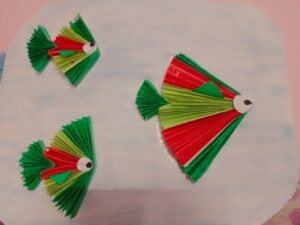 These adorable recycled paper fish would look great in either a bathroom setting or a room with an aquarium in it. These little guys are also so light that you could even hang them from the ceiling from a couple of strands of fishing line if you wanted to create a different space. 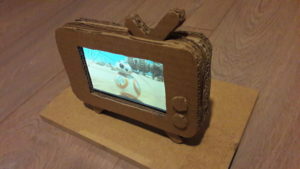 This cardboard TV phone holder is a super cute idea for a space to place your phone whenever you want to veg out to some cell phone videos. Instead of buying a more traditional phone stand, you can create this cool one out of recycled cardboard and get plenty of attention from it. Here’s an interesting toy that can maybe even win your child’s next science fair. 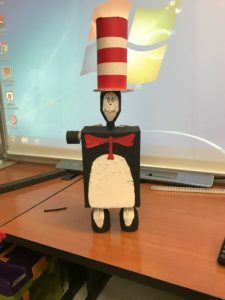 This recyclable paper robot is a super cool project to do with kids to teach them about science/technology as well as teaching them about the importance of using recyclable materials. 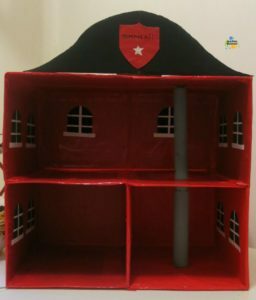 This DIY Fire Station is entirely constructed from recyclable materials such as paper and cardboard boxes. This is a super great project to do within a school library or even within the classroom. It would be fun to construct the town out of recyclable materials and teach kids about conservation. 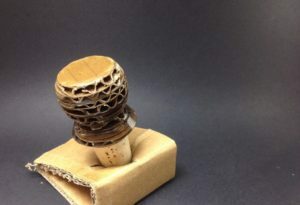 This cardboard bottle stopper would make an interesting gift for that next swanky party. This would also just make a nifty home item if you aren’t fond of buying more expensive bottle stoppers and just need a functional bottle stopper right away. Paint it to add some colors. You see? There are so many great ideas when it comes to utilizing recycled paper. Whether you need to add some flare into a child’s bedroom or you simply want to add some interesting decorations into a living space, there is so much you can do with paper and be able to help the environment at the same time. So which ideas were your favorite? Any idea you want to try? If you can’t decide on one project, why not mix and match or schedule a time to complete several? Do you have an experience working with paper? We’d love to hear from you. Leave your comments or suggestions below so we can all gain some insight on working with recycled paper.